My first (and best) Fix of the day! I’m really in need of a ‘Fix’ after making it back in one piece, after that awesome trek along the side of the mountain, and the terrace at Pauvlo’s Taverna is the perfect spot to have it ….. icey cold and goes down a treat….. not even touching the sides…… just as well that not every beer tastes as good as this first one or I’d more than likely become an old drunk! The weather this afternoon is just perfect, clear blue skies and the sun has a bit of a bite to it…. it warms your insides up. So it’s probably time for a quick swim, but for no other reason other than to say I did it. And as our hotel room is right on the beach, then why not. Ready to brave the elements… Are you ready, budgies? YM and I walk out onto the beach, when we hear someone calling out our name….. and looking back at the hotel we spot Jauren waving to us from her balcony….. yep, right next door to our balcony….and paraphrasing Humphrey Borgart , my thoughts were……”Of all the hotels, in all the towns, in all the world, she walks into mine…..” What a surprise, but I have to say a very pleasant one. Decades younger than YM and I, Jauren and Lason are both delightful company…… even without a Stetson! They are newly-weds, having been married for less than 2 months, and they are living in Xania due to Lasons work there. A week or so ago we had a ‘pot-luck’ dinner at their apartment, ( without pot!) along with some other students from the language school, and it turned out to be a really great night. We had lunch a few days ago with Jauren at ‘Apostoli’s Psaro-Taverna’ on the old venetian harbour-front in Xania, and it was while there that I talked to her about our intended Easter weekend in Loutro….. no wonder she paid so much attention to me….. and there I was thinking it was all due to my charm! Poor Jauren is full of apologies for ‘hotel-crashing’ our romantic weekend, but YM and I assure her that we are very happy to see them…. and we are, for apart from being very good company…. she is so bubbly, enthusiastic and full of life….. Jauren reminds us both so much of our own daughter. Actually, the resemblance between them is quite amazing, and for YM this is a bonus, as she misses Chloe a lot. Sorry Jauren, but you are now going to have to be YM’s stand-in daughter for a while….. I hope y’all can stand the pressure ! I mentioned earlier that we had met a lovely young Irish family who were also staying at Allison’s hotel…. Mum, Dad and three young daughters, all of whom had such outgoing friendly personalities…… and all whom had quite evidently kissed the Blarney Stone at some stage in their life…. probably more than once by the way they could talk ‘craique’ as they say in Dublin. Molly, Elly and Imogen, and John and Katherine….. On our way to dinner at Pavlo’s, they stopped us as we passed them at their room on the beach, and we joined them for a drink or two. Allison the hotel owner also joined us, and sent Molly off to the bar for yet another bottle of wine…. There go the profits Allison! A few minutes later, J and L, the two ‘hotel-crashers’ were passing by and they also joined the crowd…. It turned into quite a party….. but that’s the Irish for you. Eventually, but only after we finished off yet another bottle of ‘Aspro Krassi’ ( white wine) which Allison had stolen/ taken from her bar ( how does she make a profit?) the informal party broke up as we all made our way to dinner…. 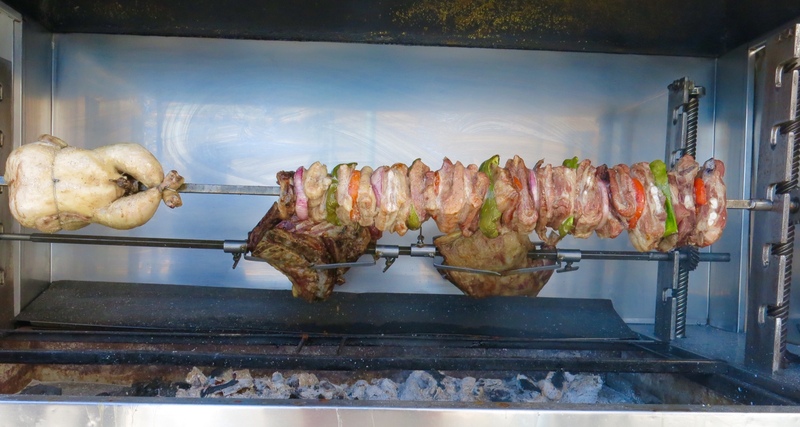 It was a race to to get there first too, as Pavlo’s only had one young kid turning around on the charcoal spit at his taverna , which wasn’t enough to feed us all…. and we didn’t want to be the ones to miss out. ….. it wasn’t as if you had an option to go anywhere else for dinner either. Kali Orexi. 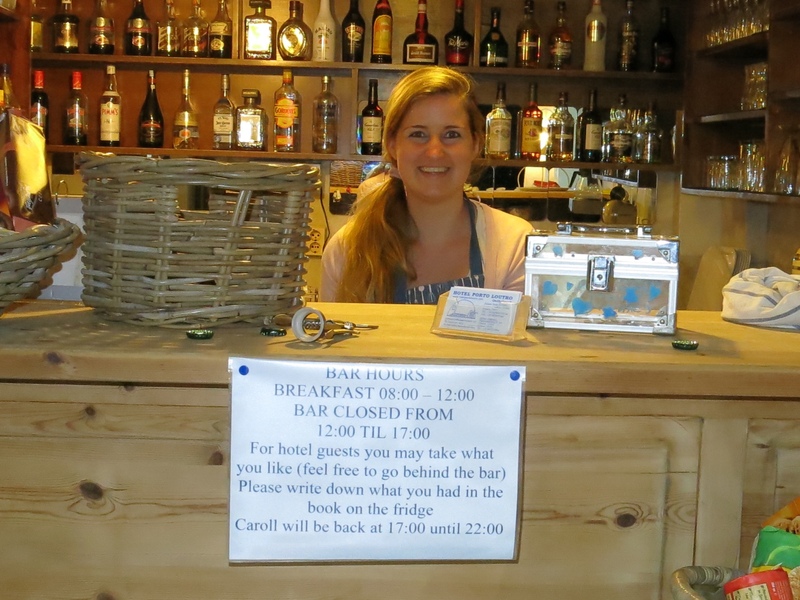 The next morning we awoke to the sound of a pneumatic drill echoing around the bay…. 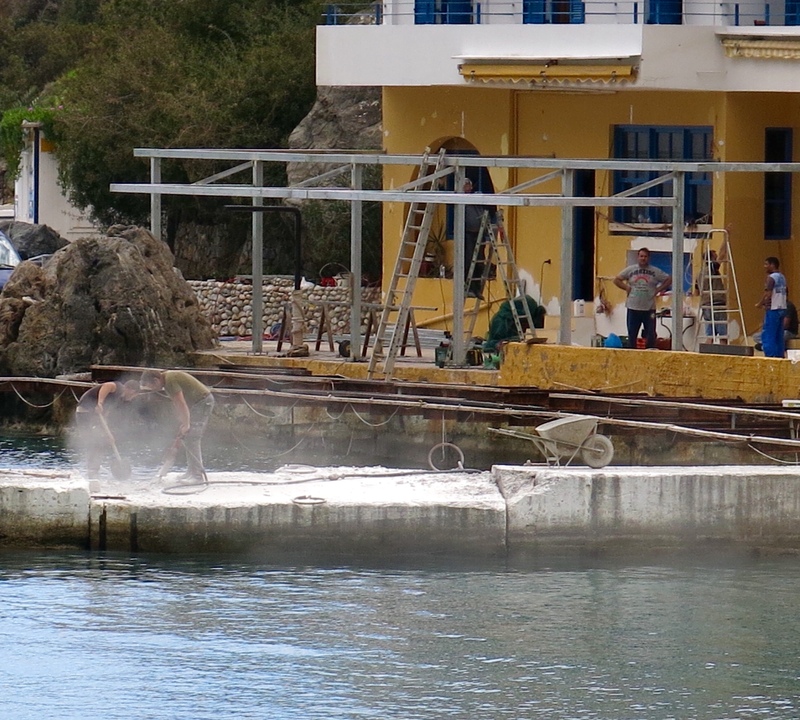 The Mallaca’s had chosen Easter ( non-orthodox) Weekend to decide that now would be an appropriate time to demolish part of the ‘newish’ concrete jetty that they had only built last year…..a part of which had sunk lower in the middle section due to the severe winter…. or just plain shoddy workmanship. The noise from this drill was unbelievably loud, amplified by the shape of the bay and the mountains surrounding it! 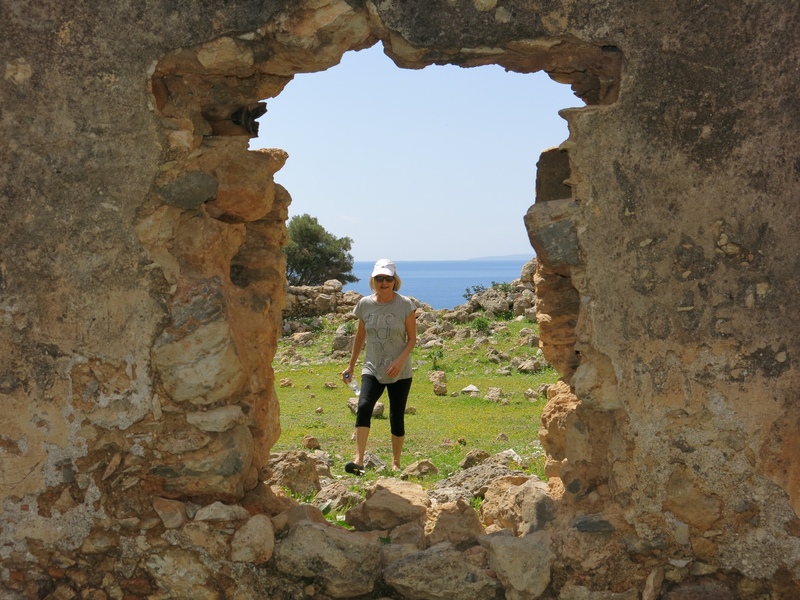 We finished our breakfast and decided to go for a walk, or hike more like it, up and over the mountain to the next small village in Finikas Bay, called Phoenix, just to escape the din. As soon as we’d gone over the first hill we experienced silence once again…. It was a hot day and by the time we reached Phoenix ( …. By the time I get to Phoenix she’ll be rising, She’ll find the note I left hangin’ on her door ) we were ready for a swim….and a drink, and not neccesarily in that order. But the gods have deserted us again, and the only Taverna in the village is busy getting a spring clean and not open for business….. so we settle for a swim off the rocks….. and if only the beer I didn’t get to drink would have been even half as cold as the water I was swimming in, I’d have been happy ! By the time I came out of the water, it looked as though the birds had all flown away and migrated out of the ‘budgie smugglers’ I was wearing …..! Phoenix….. and she’ll be waiting… but not with a beer..
After an hour or so, YM and I set out for the trek back to Loutro and thought that the drilling would surely have finished by now …. After all, it was just past 2 pm and in Greece it’s against the law, no kidding, to make any unnecessary noise between about 2 til 4 in the afternoon…. But as soon as we began our descent into the village, the unmistakeable sound of the pneumo drill at work became audible…. And louder and louder as we got nearer and nearer….What the F…. Don’t the drillers they know the law…. or what time it is? By the time we reached our hotel it seemed it was the the main topic of conversation in the village amongst the visitors…with everyone asking when it was going to stop. 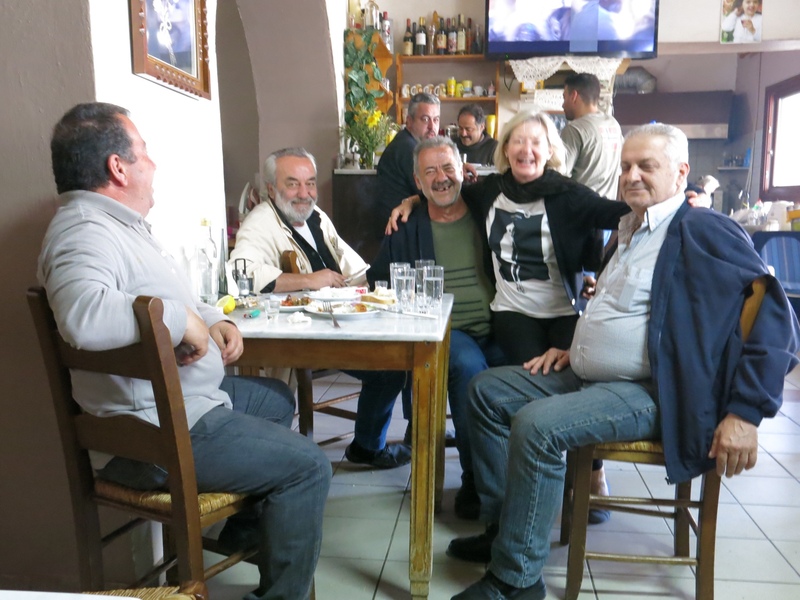 Apart from Allison, the other locals seemed quite oblivious to the noise, and even the guy who ran the taverna close by to the destruction going on didn’t seem overly concerned, even though his table and chairs….and his Bain-Marie…. were covered in a thick layer of grey concrete dust. I ought to point out also, that neither of the two workmen doing the drilling were wearing any sort of protective clothing….not even a dust-mask or earmuffs…..and the rubble caused by the destruction of the jetty was simply pushed into the harbour! To get away from the noise, YM and I hiked back over the hill towards Phoenix ( …she’ll be waiting….) 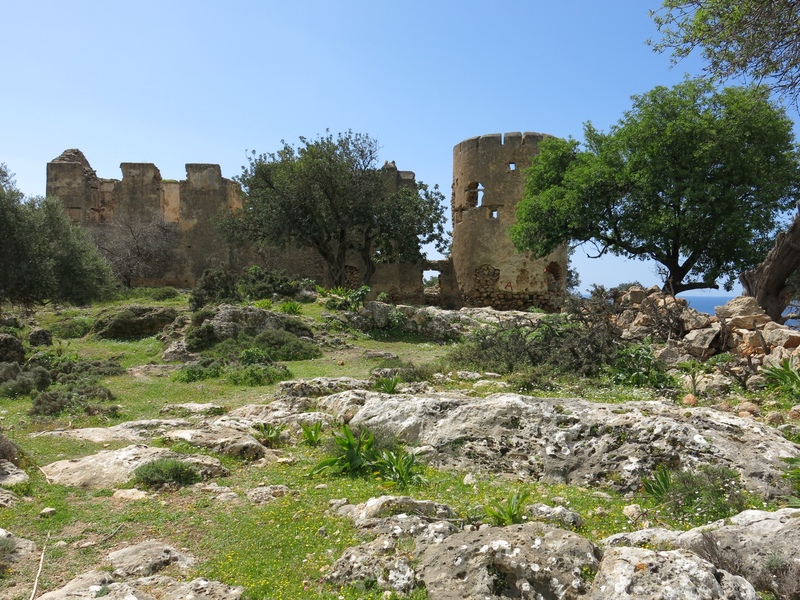 and when we reached the old ruined fort above the cliffs we found peace and quiet again…. Bliss. At around 5:30 we returned back to the village, and on the way down we met a young couple, each of them carrying a small pulll-a-long suitcase on their shoulder….well they couldn’t exactly pull it along on the stony track up the mountain…and they told us they were leaving because of all the noise. ” is it still going on?” I asked….” Oh yes”… …. 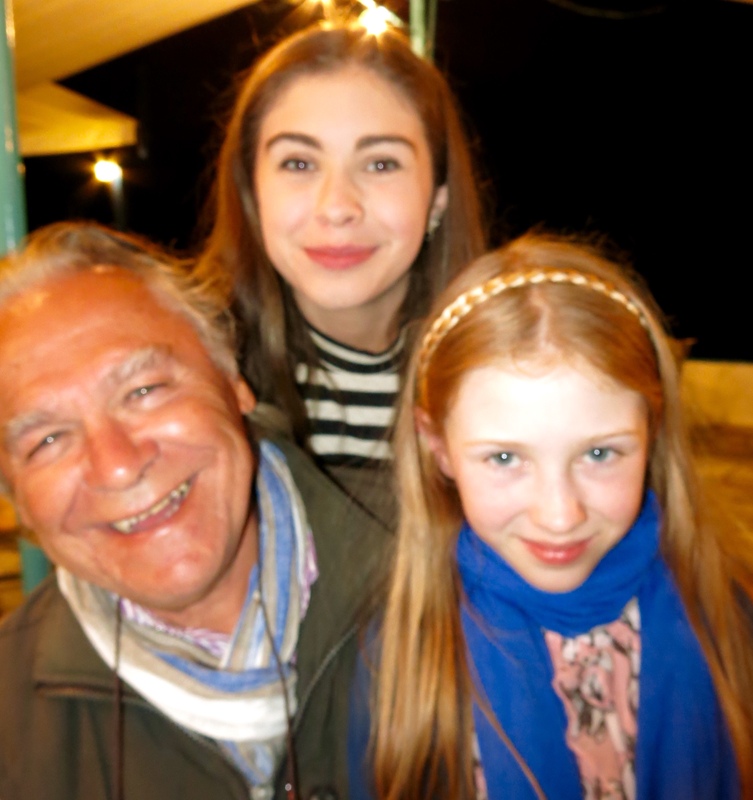 We then met young Irish Molly outside the hotel, who assured us that she had spoken to someone…. ” who Molly?” … ” oh, he was a grey-haired old man with a white beard” she says….who had told gullible Molly that they would be finishing at 6 o’clock and would DEFINATELY not be coming back again tomorrow. ” Definately not Molly?” …. “Oh no, definitely not” she assured us! 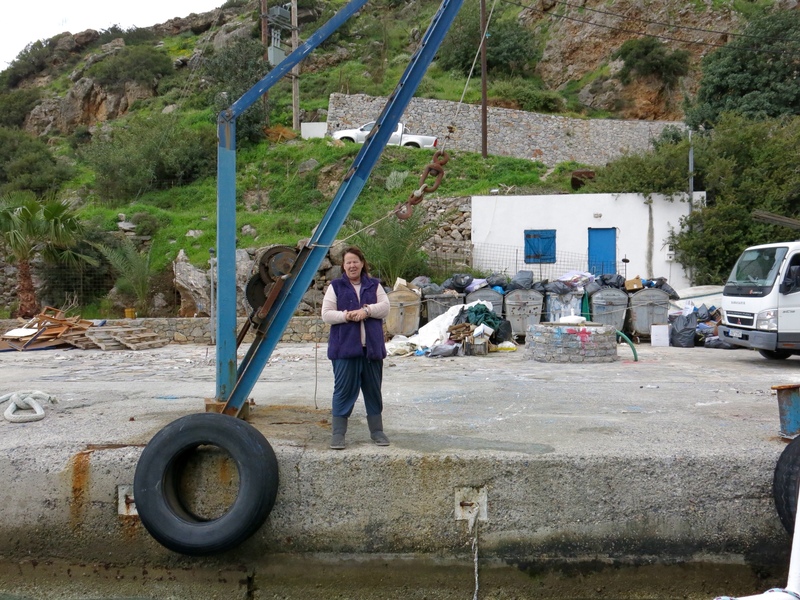 Well Molly was right, because at 6 pm they stopped drilling, pushed what remained of the rubble from off the jetty and into the water and retired to the dusty taverna for a beer, while waiting for the ferry to take them back to wherever they were from. 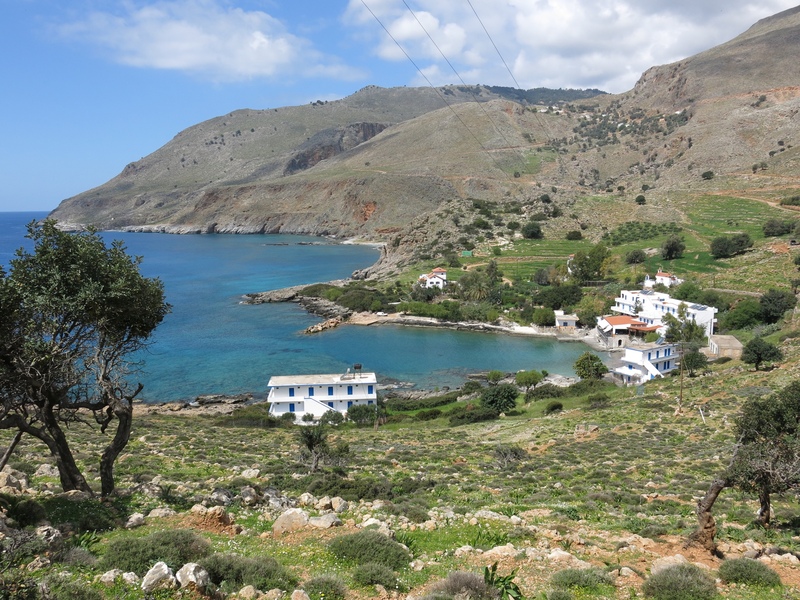 Once again, Loutro slipped back into the peaceful, tranquil, quiet place it is renowned for. 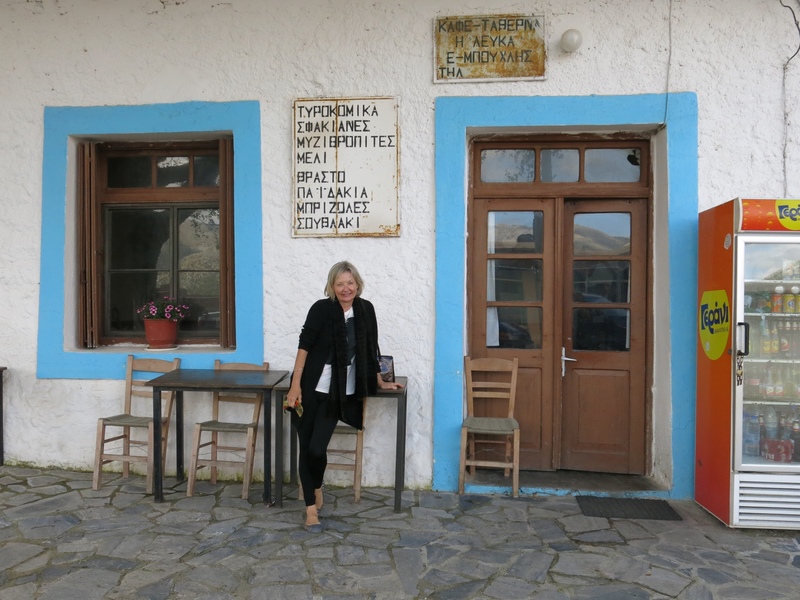 We were intending to spread the euros around a bit, by eating tonight at the only other Taverna in the village that is open right now, but having seen the dust that covers every square inch of the place…. and seeing as how they haven’t had a single customer there all day…. (Is it just me, or is the Mousaka a wee bit gritty today, Yianni…) our two “Texans” and us opt to go back to Pauvlo’s Taverna again, at the opposite side of the bay for some more of his excellent spit- roasted specialities…the rooster looks particularly good, and is. 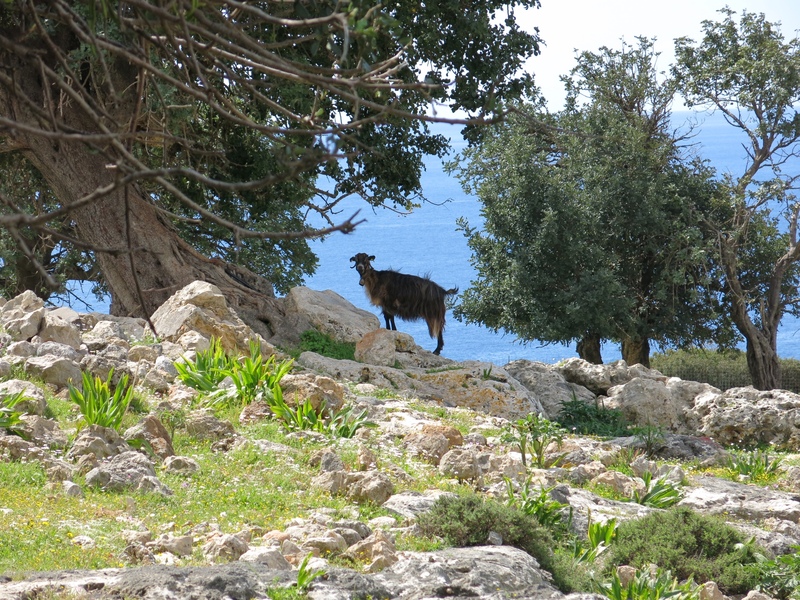 Tomorrow is Easter (non-orthodox) Sunday, and we all discuss the possibility of staying another night in Loutro….. And if the weather is still good when we wake up, then will we stay. Come morning, and the sun is shining brightly in a clear blue sky, and so the decision is made that after breakfast we will tell Allison that we intend to stay for one more night. I’d just finished eating the last piece of Easter cake on my plate, when it started again. “MOLLY…. What the heck… I thought the man with the white beard told you that they weren’t coming back” …. ” was his name Nick?…. Saint Nick by any chance Molly ?” Any thought we had had about staying disappears as quickly as a proverbial rat up a drainpipe, as we hear familiar tune rat-a-ta-rat-a-ta-rat-a-ta-tat playing on the pneumo drill . Allison appears on the terrace looking distraught, and goes around to each of us guests to personally apologise for the racket, but poor thing, it’s not her fault ( I blame Molly and the mallaca with the white beard). The small ferry boat, passengers only, no cars or trucks, is due to leave at 12:10, so that’s what us and the Texas Rangers leave on…. and leave the noise, and Molly and her lovely family, behind. We board the small boat, just as Allison comes along to wave us goodbye, and she admonishes me for not giving her a farewell hug! Being the gentleman that I am, I hop off and give her my special ‘ bear hug’ …. a not inappropriate description. I can’t help but notice that she hasn’t shown the same degree of affection towards our Texan friends….. Lucky them! Allison, sad at my leaving? Beautiful scenery at the ferry port Eh? Twenty minutes later and we are back in Hora Sfakia, with the car still on the jetty. 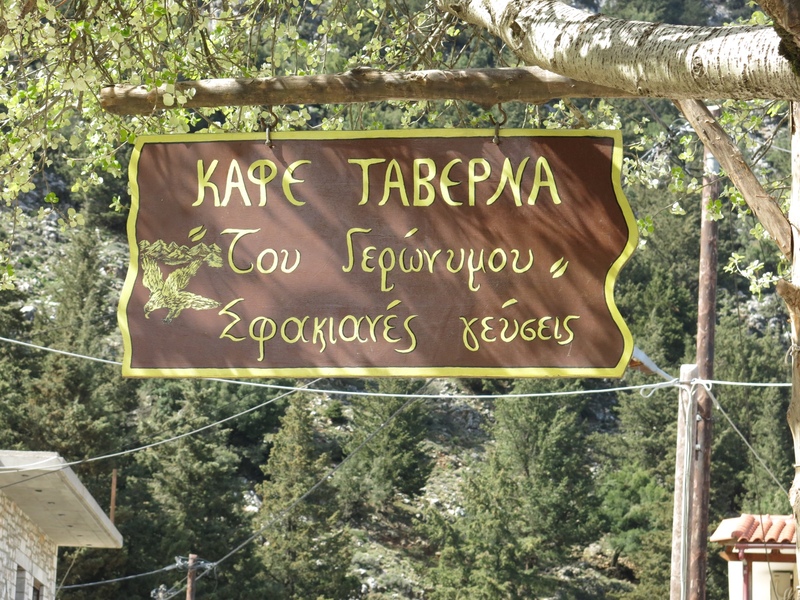 Lason and Jauren suggest we stop on the way back to Xania for a bite of lunch, so I tell them to go ahead of us and we’ll meet up at the village of Askifou Sfakia in the mountains, which is about halfway between the two places. Sure enough, we spot Lason’s merc in the village, and he leads us to a small restaurant in the Main Street…. ( that’s a joke by the way, there’s only one street in the village) which apart from a solitary guy sitting on his own with a bottle of Johnnie Walker on the table in front of him, is deserted. The owner, a lovely friendly bloke named Giorgos, doesn’t speak much English at all… even less than my Greek… so both Jauren and I put into practise all we’ve learnt…. or more to the truth, all we’ve remembered….from our Greek lessons at Kleiss Language School in Xania. 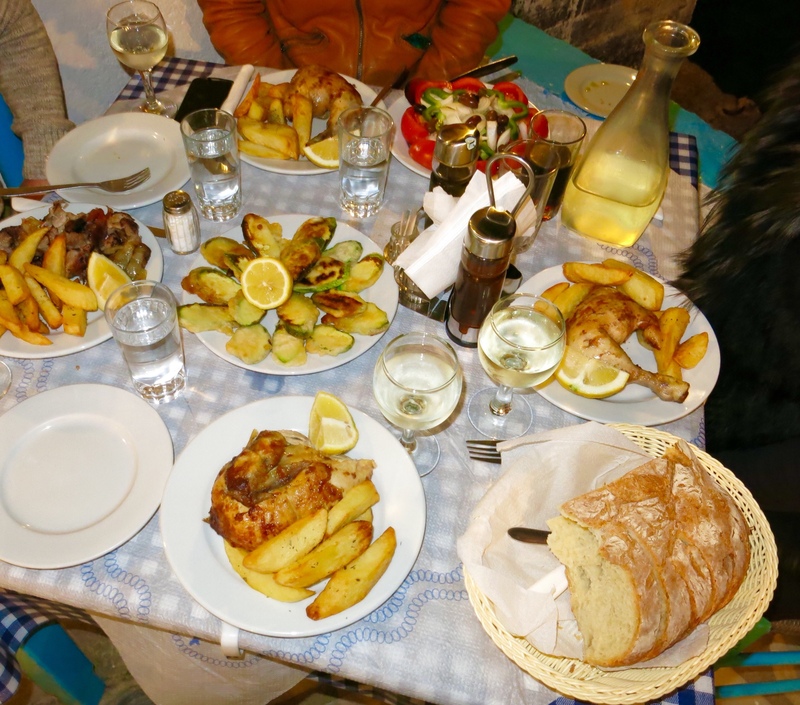 Now I’m not sure if it was me or Jauren to blame, but we ended up with more food on the table than what you would normally see on a cruise ship buffet ….I’d describe it as a banquet….and not just that, but as soon as one dish was finished, Giorgos the waiter…. and chef, and owner… brought something else to the table…. until we had to tell him to hold it at that. Did I mention that the Johnnie Walker aficionado had by this time invited himself to join us at our table? His name was Stavros and quite a character. 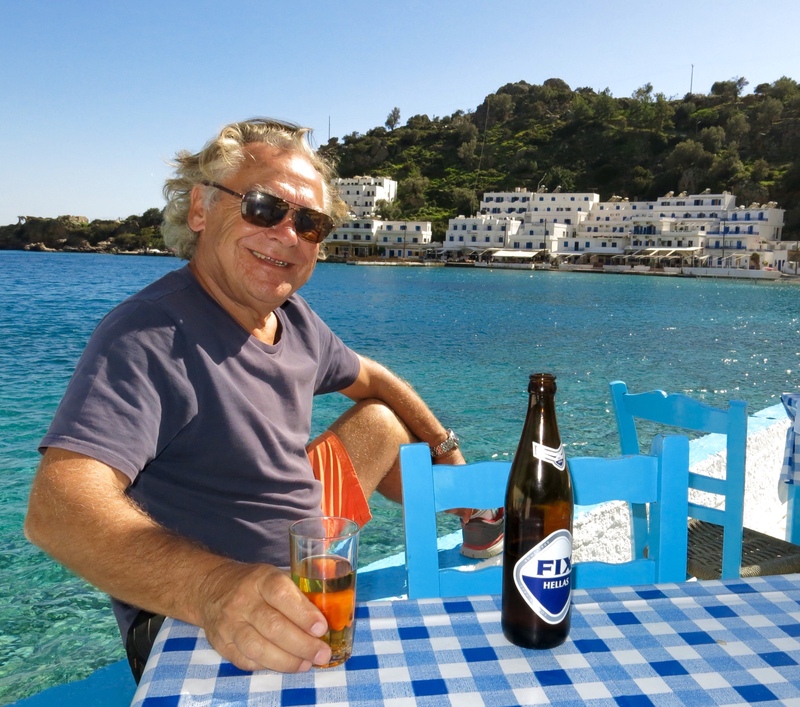 Despite having consumed the best part of a bottle of scotch already today, or maybe because of it… he was not averse to sharing a beer with us….and a wine…..while he regaled us in a 50/50 mix of Greek and English, with tales of his undoing…. Of course, it concerned the usual trio of women, alcohol and gambling…. not to mention a serious tobacco addiction. Turns out that after living in the USA for 12 years…. and having his own business….it all went wrong ( his words) and he is now back where he was born and living in a cave…. Yep, that’s right, a cave. Always nice to make new friends…. And better than making enemies up here in the mountains…those guns still work! 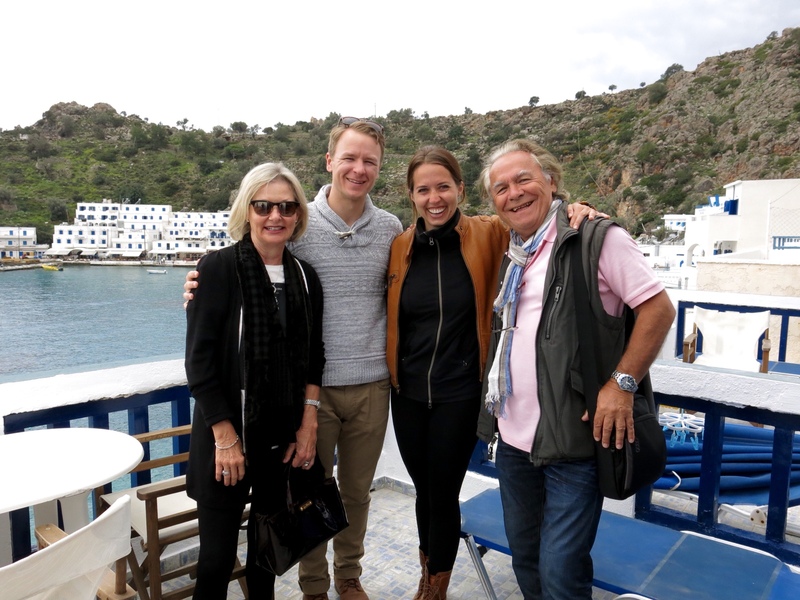 This being Crete, where the hospitality is something to be experienced, he invites us to come and see it….” has lovely view, come see, have raki, why not…. but excuse mess, is bit unmessy” (unmessy? I think that Stavro meant untidy) . We tell him that we are a bit pushed for time, maybe another day we visit his man cave, but if we think he’ll accept this you are wrong. As an alternative we are pressed into accompanying him to a taverna further along the Main Street (ah,ah, Main Street!) where his friends are waiting for him. Now Stavros Is not a man that takes no for an answer, and so while the Texans take off back to Xania, YM and I follow him to where his friends are. It’s a small place, and a bit crowded, but up here in the mountains where it’s quite cold now, there is a roaring open fire going on which is not at all unpleasant. We are introduced all round as his Australous Filous…. 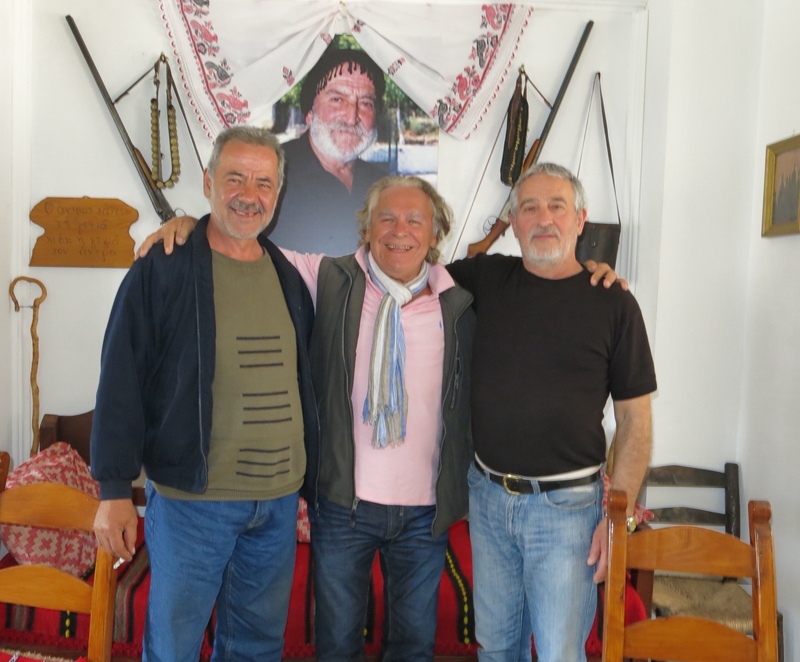 His Australian friends….and are promptly offered a glass of raki each. Ever drank that stuff? Ever bought some paint stripper from Bunnings? Ever thought of drinking it? Well if so, you’d know what it tastes like! They say that it’s an acquired taste, but even though I’ve been drinking it, far too much of it actually, for the past couple of months, I won’t go so far to say that I’ve actually acquired the taste. However, I am beginning to appreciate its finer qualities….. like its ability to dull the senses….to give you a warm feeling inside…to make you happier…. to make you appreciate life more…. and as YM has proven, it makes for a very cheap substitute for nail polish remover. 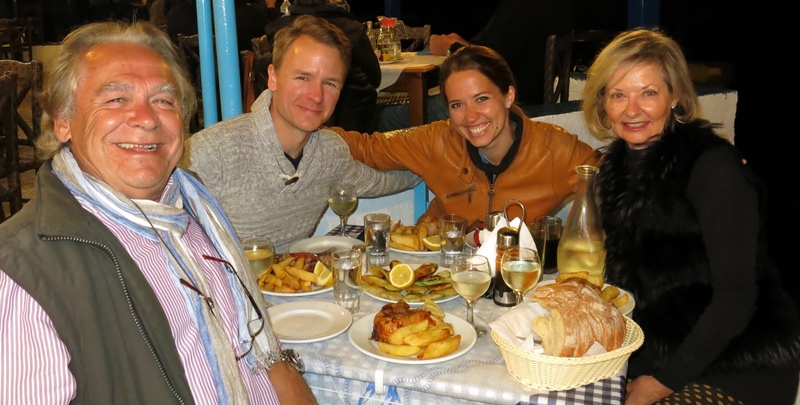 No sooner have we settled in, and on our second glass of raki, than Stavros suggests (suggests…. no, that’s not his style…shouts) to us that we have to be going…. to see his other friends in an ouzeria ( it’s a taverna that specialises in Ouzo) just up the road. Resistance is impossible when you are being urged by a Cretan from Sfakia district, as the Germans found out the hard way in 1942, so best we don’t offer any resistance. 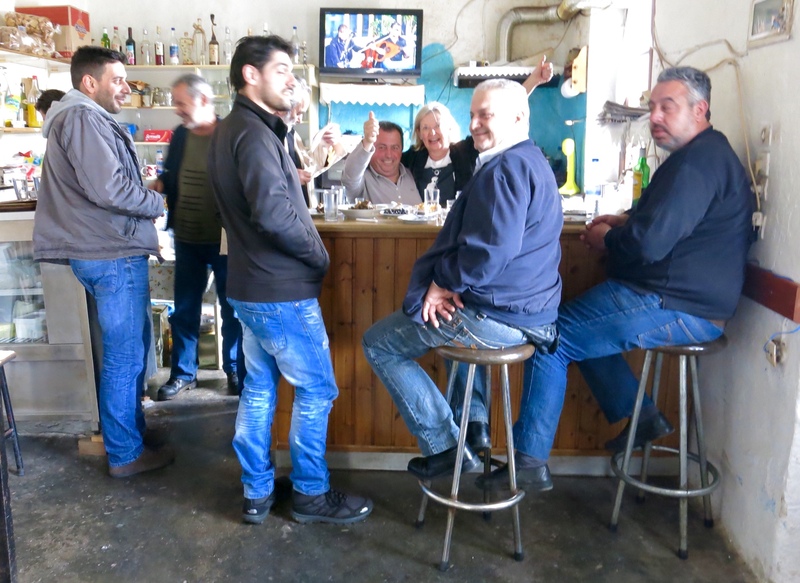 The next taverna, sorry Ouzeria, is a real men’s bar….. All the good ole boys hang out there…. and when YM enters, it causes quite a stir. 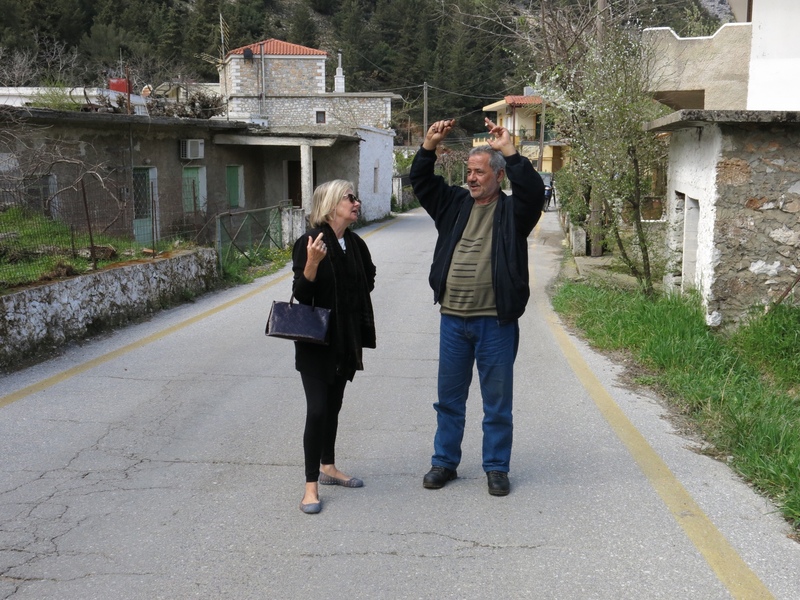 Introductions all around again, and this time the hugs that YM gets from the clientle of the Ouzeria seem to me to go a little beyond what constitutes natural friendliness….the Xenophilous…. that Cretans are renowned for. YM of course, laps up the attention, never mind that most of them are….. I was going to say quite old, but realise that I’m probably the oldest man in the place… not that young! And in true Cretan style most haven’t bothered to shave for the last week or so.. …designer stubble is de-ruigur in these hills. (it’s the law, remember) This time the Ouzo’s are on me, but as I’m driving I don’t have another drink myself. ‘Yetee’ they all ask, ‘why not?’ When I say I can’t because I’m driving it causes great laughs all around, and I’m informed that, Ella re, ehh, it’ll make you a safer/ better ( Kalitero) driver if you do have some more drinks!!! Mmmm….that explains a lot about the standard of driving ability hereabouts…. but I ignore their taunts and settle for a Ellenikos Kafes…. A greek coffee. If that doesn’t sober you right up, then nothing will. I Eventually manage to extricate YM out of the place…. they don’t know, or have maybe forgotten, that I can understand enough Greek to understand that their comments are becoming more and more lewder and provocative….. not helped in the least by Lesley’s YM’s behaviour I might add…. 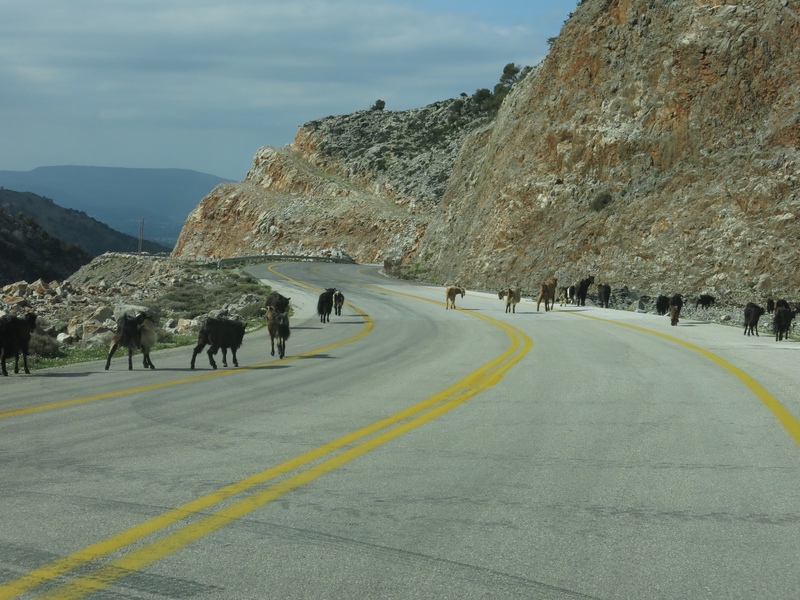 The drive back to Xania is a pleasant one with no surprises on the winding mountain road, apart from having to stop occasionally to let next weeks Easter lunch cross the road, and we return our hire car back to my friends at Tellus. Thanks for the update. Are you ever home? 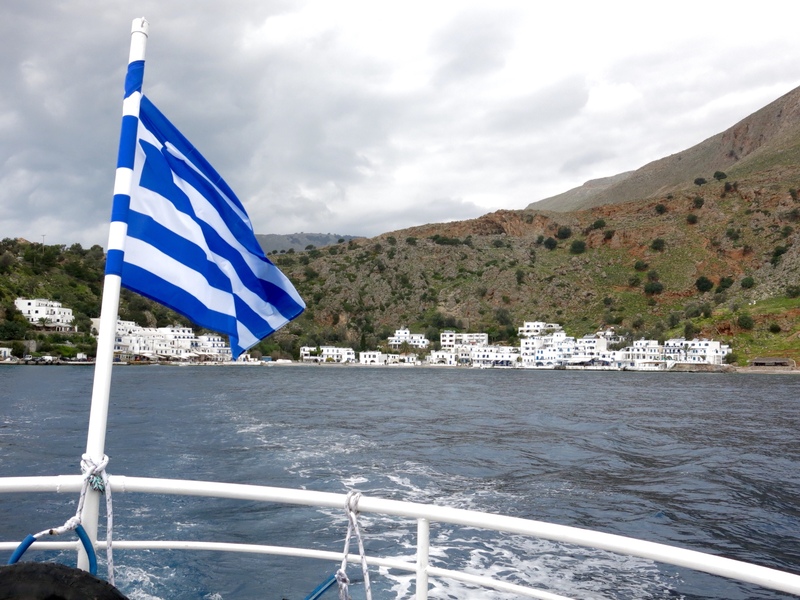 Need to spend some time in Greece – sounds like fun ……. or do you just make it lots of fun?? Just luuuuve your amazing adventures, can see Lesley has been having fun too !!! !